All in all New Zealand was not as exciting and packed with flying as I had hoped, the weather at each turn seemed to be causing issues everywhere. I spent the last few days in a town called Whangerai in Northland, about an hour forty minutes away from Auckland. I was on the phone to wings and waves many times trying to arrange flying but the late March wind and weather wasn’t going to play ball. Hence we finished our time in New Zealand without any major flying being done. Onwards then to Sydney and our last few days in the Southern Hemisphere, I had already located several sites around Sydney and made use of their excellent site guide website, much better than paragliding earth to be honest. It would be good to see a similar approach in the Northern Hemisphere for a well designed and laid out site. I once again got on the phone and contacted a local pilot from the Northern beaches club, again excellent information was given from local pilot Brett, who put me into contact with Sandy, a regular flier at the site. So on Tuesday morning the weather forecast showed a possible breeze developing mid morning. I phoned Sandy and the general opinion was that it could happen. Given the days that we had missed before I decided to go to the site and parawait, the other half didn’t seem to mind given that the sun was out and there were going to be beaches near by. The bus route it turned out was pretty easy, a bus could be caught directly outside our bed and breakfast which would reach Long Reef after about 20 minutes, so we waited for the 155 and hopped on the first bus going that way. 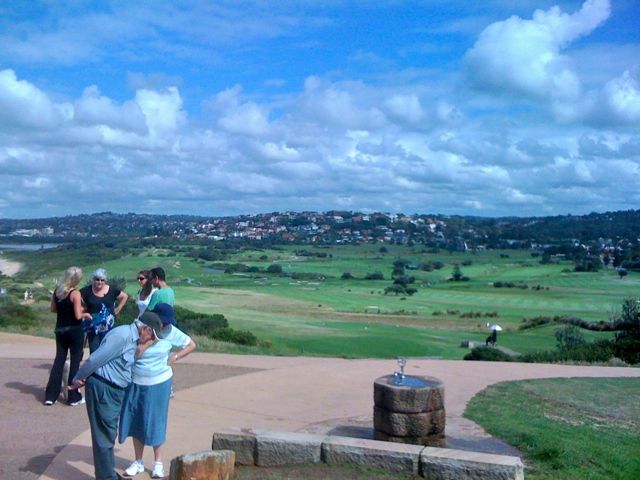 Long reef is a small jut of land that contains a golf course and beach and not much else. There is a bit of a walk from the road up to the launch site, which winds through the trees and along the golf course. However once reaching the top excellent views can be had looking both south and north, the ocean breaking below and the sun shining makes even parawaiting a pleasure. The lookout point is also a popular walking spot and has been designed with this in mind. A water fountain is provided for both walkers and dogs, and also comes in useful for those paraglider pilots that have bombed out onto the beach below and have to walk back up to the take off. Talking about the take off, it was rather small, smaller than I am used to flying in the Alps, there was enough space to lay out 2 gliders. Although the width of the area is quite small and behind the glider there is the walking path and then small trees, so in the 10 knot wind, one must ensure that you lean back and get the glider above your head cleanly. I was a little bit nervous after my failed launch attempts in New Zealand, the wind was now just as strong and I had little space to work with. I had researched other high wind reverse launch techniques and found out about the Mitsos technique so was planning to try this out. This approach was backed up by Sandy suggesting that I use it, before I had even begun to set up. The wind was on the ridge although slightly Northerly, but Sandy suggested that we try it, and after a good brief about landing and danger areas I set up, and prepared to try my first Mitsos reverse technique. Which for a first time worked well, the wing came up straight I controlled it and turned and lifted off easily, although nearly clipping the bushes on the cliff edge. and my soaring technique is not yet brilliant, and I found myself slipping down the slope. Sandy had suggested that I could try a top land in the conditions, but the small landing area and large amount of spectators put me off so the beach below started to look inviting. I tell you what, climbing back up with a wing on a beach through gates and across bushes is not fun. Next time light and smaller harness will be used. I tried a second time only to bottom out quicker than first time around, so alas with the wind strengthening I called it a day. That was it, rush back to the hotel, wing packed, bus caught. 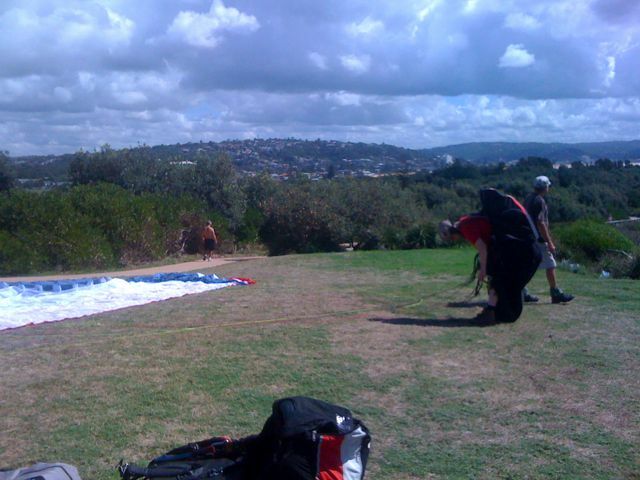 I arrived to find Sandy plus one other Paraglider and a Hang glider setting up., ready to go. It seemed that the wind had changed early as the sun got up and promoted the sea breeze. Again we had plenty of spectators, since Sandy had been there from 10 in the morning. Another quick brief with Sandy on the site, with the wind being smoother and more laminar he suggested that I would have no problems staying up this time. The Hang glider pilot was ready to go so I got out of the way while I wondered how he was going to launch in such a confined space. Interestingly Long Reef is denoted as novice site for PG but intermediate for HG. It soon became apparent why, with Sandy and the second paraglider supporting the nose and wing tip, they slowly maneuvered the hang glider into position. Which was precarious to say the least, with his nose hanging over the edge of the ridge, my girlfriend turning away fingers ready to dial 111 to call out the emergency services. The pilot waited for a good gust and, well, just dropped off. To be soon swooping back up and running the ridge line. “More balls than us” was a profound comment from the PG gang. Again I was using the Mitsos technique to launch, Sandy suggested that I step as close as possible to the edge as to allow some movement due to the stronger wind. I managed to get the wing up easily and cleanly, but hesitated too long in my turn and lost the stability of the wing. The second attempt resulted in a turn and then getting dragged backwards, I quickly killed the wing on the C risers along with help from Sandy. A helpful hint was that I should apply little or no brake if at all possible in the wind conditions that just increases your drag and gets you pulled backwards. This is obviously different from light wind reverse launching in the Alps, where brake is used once you have turned and started your run forward. Only 3 on the ridge, in summer we get loads more! edge, lifted my feet, little bit of brake and I was off. The flow was defiantly more laminar and after a couple of beats I was climbing well. I was cautious of sharing the air with the hang glider, although he gives way to me I didn’t want to upset his flight, the ridge is only 1 km long and 2 PGs and one hangy for me, is a bit busy. However I could sit mid ridge and beat up and down without any problems, allowing the hang glider to sit over the fence line. After climbing about 100 metres which seemed to be the maximum with the hang glider staying at the same level, I settled down realising that landing had stopped becoming a looming possibility and I enjoyed the flight. The views over to the Northern beaches were stunning. Plus I had large waves and breakers washing over the shore beneath me, the sun was shining and the flying relaxed. The Reef is a popular walking spot, but is also filled with high school children on field trips. Our field trips in the UK focused around wet grey days on Skegness beach, still I’m not bitter about it. It’s nice to have spectators, maybe one of them will one day look up and watch and see the freedom and fun that we are having and give it a go, I spent some time on the ridge with a small Harris hawk type bird of prey, who’s skill far out stripped mine, but it was nice to be in the same air, I too was practicing my hovering skills, although I passed on the dive bombing and catching the mice. A few school children waved and were overjoyed when I waved back, much like the tracker who honks his horn on request, I felt slightly smug. After 35 minutes of playing, I landed on the beach again, not wishing to try a top landing with some many people and the wind having gotten slightly stronger. This entry was posted in New Zealand, Paragliding and tagged australia, buzz z3, new zealand, ozone, paragliding, photography, ridge. long reef, strong winds. Bookmark the permalink. 1 Response to Long reef, possibly the best so far. Brilliant blog mate and I would be lying if I said I wasn’t jealous! I like their sites guide pages, the layout looks somewhat familiar to our http://www.curiumsoaringclub.com site that I built – wonder where they got it from hehehe probably coincidence I’m sure ;0) but it’s given me ideas for our own site’s guides. So where are you off to next?